Many people find the bald cypress to be a very nice addition to the landscape, from its natural, pyramidal shape and range of habitat to its light, airy appearance. It remains somewhat obscure, however, despite positive reviews from growers across the U.S.
Several websites allow landscapers and homeowners to send in reviews of their experiences with various plants and trees. 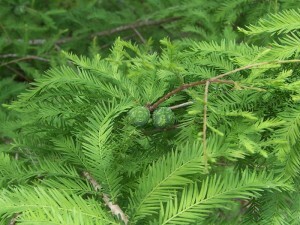 The bald cypress is favored over a large geographic area – from Massachusetts to Florida and as far west as Texas. 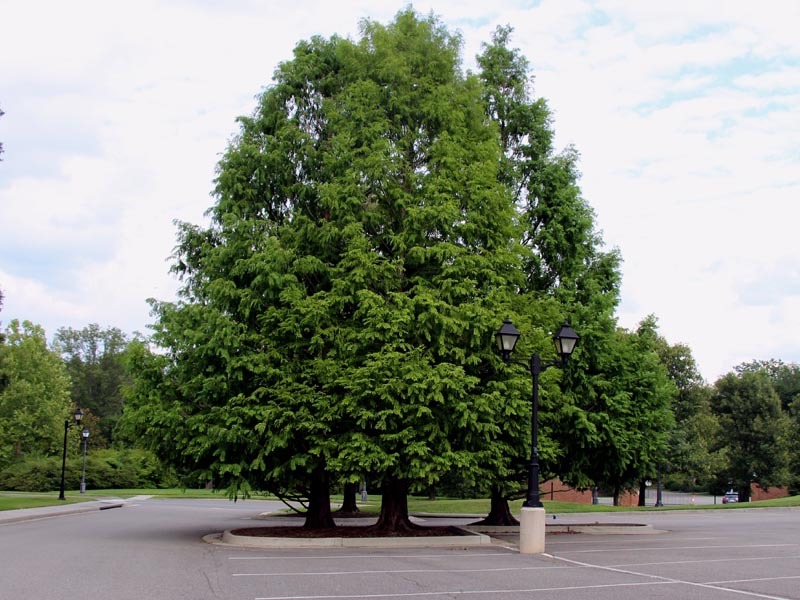 When allowed plenty of room to grow, it is a stunning specimen tree in both urban and suburban settings. It resembles the Dawn Redwood, a close relative, and its wood is favored for building material with its straight-grained appearance and resistance to warping. A distinctive growth habit familiar to those who see the bald cypress growing in swamps and wetlands, particularly in the Deep South, is the presence of “knees”. The knee is actually a root called a “pneumatophore”, meaning “air bearing” and it was thought these helped the tree to obtain oxygen. However, recent experiments have demonstrated little actual exchange of oxygen between the knees and roots, despite their being partially or fully submerged in water. It is believed that the knees serve the more important function of anchoring the tree in place, providing stability in moisture-laden soils. Like many tree species growing in rainforests, the bald cypress also buttress themselves by flaring out part of the lower trunk, creating flanges to help support the height of the tree, which can reach 125 feet tall and 5 feet in diameter. 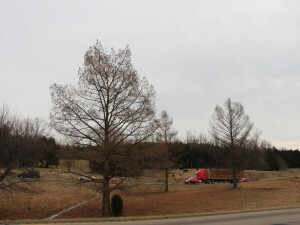 “The Senator” with a diameter of 17 feet and height of 125 feet was the oldest known living bald cypress in the world, celebrating its 3,500th birthday in 2012. It was also the largest tree of any species east of the Mississippi. It lived in Florida where its grand stature served as a landmark to Seminole Indians and other Native Americans for many centuries. Unfortunately, this amazing tree is referred to in the past tense since, in January, 2012 a meth addict decided there was not enough light inside the hollow trunk to see the drugs she and a fellow user were preparing so she got the bright idea to start a fire… inside the trunk of the oldest known tree of its species in the world. She managed to burn the Senator to the ground. After the death of the oldest known bald cypress, the new champion, formerly known as “The Companion” and now referred to as “Lady Liberty”, comes in at a youthful 2000 years old and lives near where the Senator stood. A few more interesting facts about the bald cypress are that it is one of the few deciduous conifers with the needles turning an intriguing rust-red color in the fall before they drop to the ground, revealing the fine, balanced structure of the limbs. The bald cypress is the state tree of Louisiana and the name taxodium means “like a yew” and distichum means “two-ranked”, referring to the arrangement of the needles. According to the National Wildlife Federation, each cone is made of sets of scales, and each scale has two triangular seeds. Seeds are eaten by wood ducks, evening grosbeak, wild turkey, water birds, and squirrels. Toads, frogs and salamanders use swamps dominated by bald cypress as breeding grounds. Bald eagles build nests in the treetops, wood ducks nest in hollow trunks and the submerged hollow logs provide catfish spawning ground. Update 11/15/17: The largest tree in Virginia has fallen. 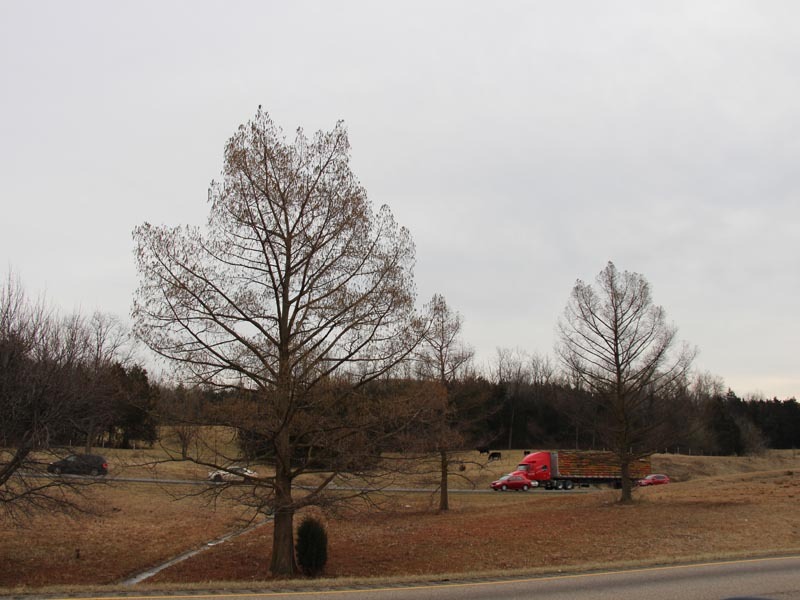 Big Mama, a champion bald cypress in Courtland, Virginia toppled from wind. Read more here.